IBM 49Y4242 PCI-Express Netwerkkaart kopen? | That's IT! Professionele, door Intel geproduceerde PCI-Express x4 4-kanaals server-netwerkadapter. Gebruikt maar in absolute nieuwstaat. Wordt bulk in antistatische verpakking geleverd. Deze adapter is een low-profile model met een full-height bracket, welke eventueel met wat handigheid naar een low-profile bracket is om te bouwen. Based on the new Intel® 82580 Gigabit Ethernet Controller, the Intel® Ethernet I340 Server Adapter is Intel’s fourth generation of PCIe* GbE adapter. 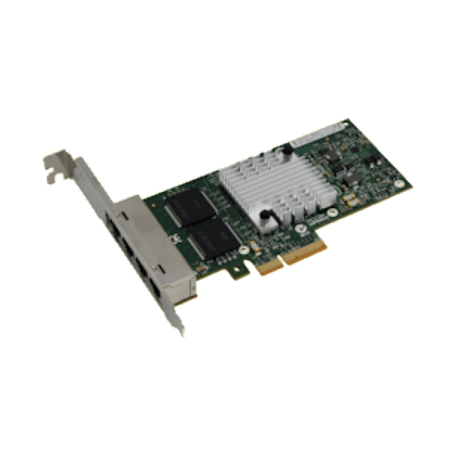 This adapter showcases the industry’s first fully integrated quad-port PCIe Gen2 GbE controller, providing a smaller footprint and lower power dissipation. In addition, the Intel® Ethernet I340 Server Adapter offers advanced features, including support for multi-core processors and server virtualization, as well as a scalable PCI Express* Gen 2.0 interface. Intel’s first eco-friendly halogen-free board combines low-power and cost for the best price/performance ratio in a quad-port solution available today. Working to create a more environmentally sustainable future, Intel is pleased to introduce its first halogen-free Ethernet Server Adapter. The transition to halogen-free products is not government mandated, but driven by Intel’s goal to eliminate the use of environmentally sensitive materials. The move to halogen-free products marks another step in our continual march toward minimizing the environmental footprint of Intel’s products, processes, and technologies. This quad-port adapter provides high-performing, multi-port Gigabit connectivity in a multi-core platform as well as in a virtualized environment. In a multi-core platform, the adapter low halogen applies only to halogenated flame retardants and PVC in components. Halogens are below 1,000ppm bromine and 1,000ppm chlorine, supports technologies such as MSI-X, and Low Latency Interrupts that help accelerate data across the platform, improving application response times.